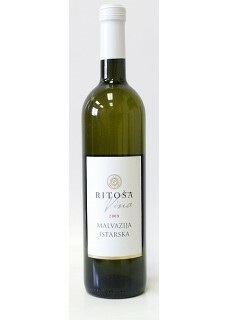 New vintage of boutique winemaker Ritoša. This Malvasia comes from the red earth. Full body and a beautiful freshness. Produced from pure grape must with fermentation temperature control on selected yeasts chosen to leave the natural taste of Istrian Malvasia. Light straw colour with greenish overtones, prominent fruity aroma, with a hint of flowery notes. Balanced, complex taste in the mouth, lightly warming with lingering aftertaste. It is a fresh, fruity wine that is well chilled ideally in the spring and summer seasons. Food pairing: White meat and fish.